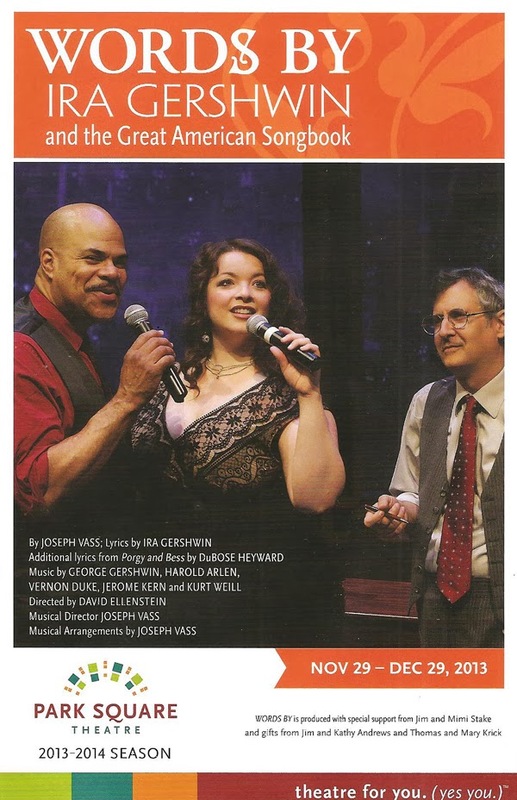 Park Square Theatre's Words By... Ira Gershwin and the Great American Songbook is a little like an installment of the Ordway's Broadway Songbook series come to life. In it, we learn about the less famous Gerswhin brother Ira, the one who wrote the words that accompanied many of his brother George's timeless melodies. But unlike Broadway Songbook in which a narrator regales the audience with stories and facts about the chosen subject, in Words By... the stories and facts are relayed by Ira himself. Or at least, an actor (Ari Hoptman) playing him. 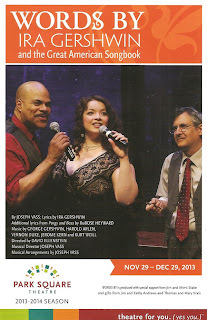 He also sings a few of the songs, along with the fantastic singers T. Mychael Rambo and Jennifer Grimm. The result is an educational, fascinating, entertaining, and inspiring two hours of music and theater. Before seeing the show, I didn't know much about the Gershwin brothers, and in fact was only vaguely aware that they were brothers. The children of Russian Jewish immigrants growing up in Brooklyn in the early 20th century, younger brother George was a prodigy on the piano from an early age. Not wanting to capitalize on his brother's success, Ira began writing lyrics with other composers under a pseudonym, only later working with his brother after he had established some success of his own. As told by Ira in the play, the brothers had a wonderfully collaborative working relationship writing for musical theater (including the first musical to win the Pulitzer Prize for drama, Of Thee I Sing) and movies. Sadly, this collaboration was cut short when George died of a brain tumor at the age of 38. Ira continued working with other composers, but many of his great works (and the majority of the songs in the play) were written with his brother. As Ira, Ari Hoptman is incredibly personable and believable, to the point where I almost forgot it wasn't Ira himself telling the stories. His stories and recollections are accompanied by photos show on a screen, and of course, the songs themselves. Songs with fast, clever, lovely lyrics like "Fascinating Rhythm," "'S Wonderful," "How Long Has This Been Going On?," "Let's Call the Whole Thing Off," and "They Can't Take That Away From Me." The songs are performed by a wonderfully jazzy four-piece band led by Joseph Vass on the piano (who also wrote the show) and two incredible singers. T. Mychael Rambo is always such a dynamic performer with a beautifully smooth voice, so it's no surprise that he is that here. But I was kind of blown away by Jennifer Grimm. I've seen her a few times before, but nothing like this where she takes center stage and just owns in (in a series of fabulous dresses). Her gorgeous voice is no better on display than in the Act I closing number "The Man That Got Away," a song that Ira and Harold Arlen wrote for Judy Garland (to whose voice Jennifer's is not dissimilar). Another highlight is Mychael and Jennifer singing songs from the Gershwin brothers opera Porgy and Bess (the new revival is coming to the Ordway in March). Words By... continues through December 29. It's truly a treat to hear these classic songs performed by such talented artists, accompanied but the wonderful stories about how they came to be, and to learn a little about the art of writing lyrics. Ira describes it with this quote by his friend Yip: "Words make you think a thought, music makes you feel a feeling, a song makes you feel a thought." If you love the standards, or are interested in the history of American music, this show is a must-see (discount tickets available on Goldstar).